Step 1 Preheat oven to 350°F. Line an 8-inch square pan with parchment, allowing paper to extend over sides of pan to create handles. Step 2 Combine oats, sunflower seeds, and pepitas on a rimmed baking sheet. Bake until fragrant and just beginning to brown, about 10 minutes, stirring after 5 minutes. Transfer mixture to a large bowl; stir in coconut, flaxseed, and spirulina powder. Step 3 Stir together oil, sunflower butter, and salt in a small saucepan; bring to a boil over medium-high heat, stirring often. Stir in honey and remove from heat. Pour honey mixture over oat mixture; stir well to combine. Firmly press mixture into prepared pan. Chill for 1 hour. Step 4 Using parchment handles, remove mixture from pan. Cut into 16 2-inch bars. Serve bars immediately or wrap in plastic and store in refrigerator. 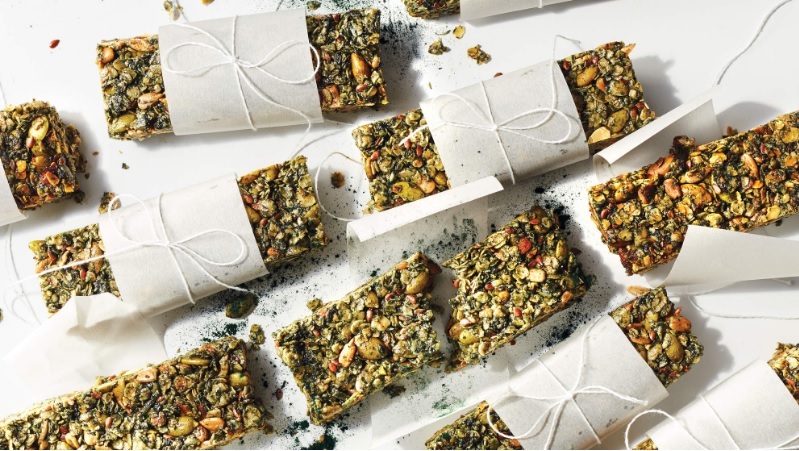 This recipe makes a nutritious on-the-go breakfast, but it’s also an easy-to-pack snack option for later in the day (and one that won’t leave you with the energy crash that follows a sugar-laden granola bar).